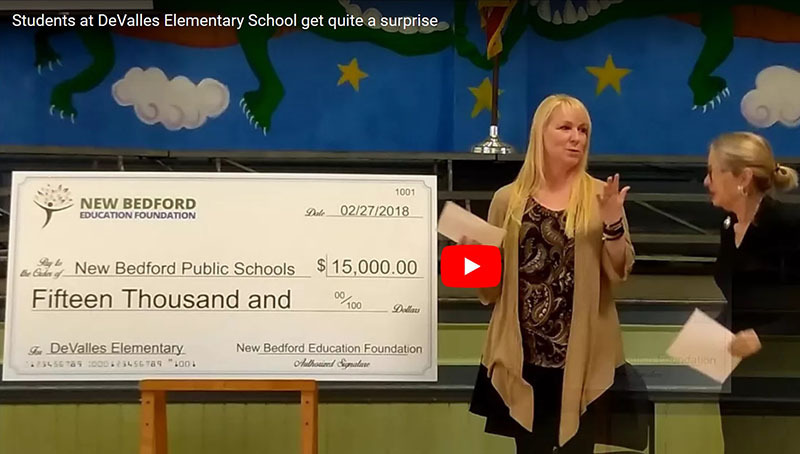 On February 27, 2017 the New Bedford Education Foundation presented the DeValles Elementary School, New Bedford a grant award in the amount of $15,000. Principal Darcie Aungst applied for the Whole School Grant from the NBEF. The De Valles’ biggest initiative this year is to get students to write and the staff has struggled to encourage them to like writing. In reviewing school needs the biggest challenge is technology. DeValles has been awarded two Chromebook carts with 30 Chromebooks each. The school will develop an online newspaper to be published at least twice a month. The students will be fully responsible for the development and content of the newspaper with facilitation by staff. The hope is that students will become more interested in writing if they are able to choose content and publish it to show family and friends. The project will culminate with all students choosing one piece of writing to be published in an anthology of DeValles student work.